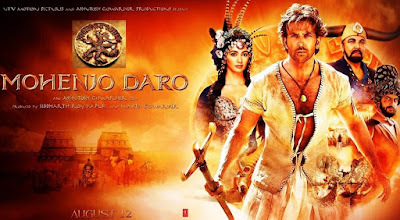 Mohenjo Daro - A valiant village youngster chased by constant dreams of childhood memories and a uni-horn animal; leaves his relatives in search of realizing his dreams and reaches a city which is under the rule of a tyrant, who wants his son to forcibly marry the girl (Pooja Hegde with unlike Dooja Head-gear) of city's head priest and succeed him as a ruler. The youngster stands against the father & son duo and wins the heart of the girl and support of other citizens along. He also finds out the truth behind his dreams that he is the son of earlier ruler of that very city who was killed through a betrayal. With the help of his supporters, he overpowers the cruel ruler and his son and forces; saves the whole citizens from a flood and takes them to a safer place to resurrect living, where he sees the uni-horn animal of his dreams and christens a river as 'Ganga'. Thus ends the saga over which nothing to go gaga. Nothing new or exciting in the movie for which, three long years of time was invested for neither thrills nor music to ears. Naive graphics, inexplicable language usage, irrelevant acts of valor, disgusting disguises and unnecessary lengthy scenes make it even more unpleasant. Except for the name, nothing is glorified of the famous 'Mohenjo Daro' (or Harappa), its culture and civilization; just shows the lack of preparation and only elements of commercialization. If director refrains from making such a failure in future, audience will say to him 'Lakh Lakh Thora' (Grateful to you).